Week two of my festive canapes are these little beauty’s that I came up with whilst racking my brain for a lighter, lower sausage roll option. These little bites are the perfect replacement. Meaty with a little sweetness and the goo of lovely cheese they really hit the spot for a bargain of 2sp. 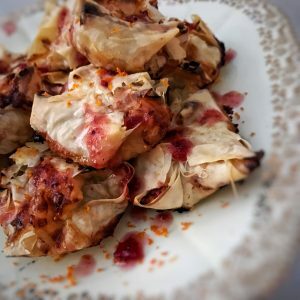 This recipe makes 24 small parcels however if you fancy making them as a starter for Christmas Day you could make them twice the size and only make 12. They would be 4sp instead of 2sp each. These are best served hot as, once they start to cool down, the filo pastry can go a little soft. Still delicious but the crispyness of the pastry is lovely too. If you are making for a party contribution, make them up at home and take them with you uncooked. Then quickly cook them at the party for maximum oooooo’s. I made these and took them along to class last week and they went down a storm. They are so simple to make and feel like a real treat for only 2sp. The perfect treat to take along to any festive party to make sure you can eat and stay on track! Take a large bowl and add the turkey mince, spring onion, garlic, crumbled stock cube, a little grating of nutmeg and the zest of the small orange. Pop 4 tbsp of the cranberry sauce into the microwave for 30-40 seconds so it melts and add to the bowl. Season well with salt and black pepper. Mix everything together until well combined and pop to one side. Lay the filo pastry out on a chopping board (one sheet on top of another) and cut all the sheets into 9 equal sized squares. You will only need 6 of the square piles so save the others for another day. Cover pastry with a tea towel (you want to work quite quickly as the filo can dry out quickly and go crispy making it difficult to work with). Pop 80g of light butter in a bowl, microwave for 20 seconds to melt and pop on the side with a pastry brush. Pop the brie cubes in another bowl and get ready to assemble. Take one square of pastry, brush with a little butter, add another square on top of it to form a ‘star’ shape, brush again and then top with a third. Add a heaped tsp of the turkey filling and push a cube of brie right into it (the meat should surround the cheese to stop it spilling out the pastry when cooking). Fold the corners of the pastry in to the centre to formal a little parcel, sealing with a little more butter. Place each parcel on the baking tray. Repeat 23 times to make 24 parcels in total. All parcels should have a little butter on top before they go in the oven. Pop the baking tray in the oven for 15-20 minutes until the pastry goes golden, the turkey mince is cooked through and the brie has started to melt. Finally, mix 1 tbsp cranberry sauce with the juice of the small orange. Pop in the microwave for 30 seconds to melt the cranberry sauce and stir both together to form a loose dipping sauce. Serve hot with either the dipping sauce in the centre or drizzled over the top. Finish with a little orange zest over the top (not essential but looks pretty! ).